The Almond Barn or Garage Plans start with a 32'x24' main building with two big parking bays and easy stairs up to a big loft. The main building has an 8' wide door at the back to an area for your lawn tractor, bikes or hobby vehicles. There are optional 12'x24' shed-roof additions that you can build on either or both sides or across the back. They are for additional parking spaces, workshop areas or storage spaces. You can build the additions right away or use them to expand your barn in the future. The plan and illustration above show one addition, used as a tractor or collector car garage and workshop, built on the right side of the main building. Plans are $59.00 plus $5.00 for shipping, for three complete sets of drawings. The plans come with a complete money-back guarantee and include add-on garages, workshops or storage sheds that help you build a variety of different layouts including what's shown above. 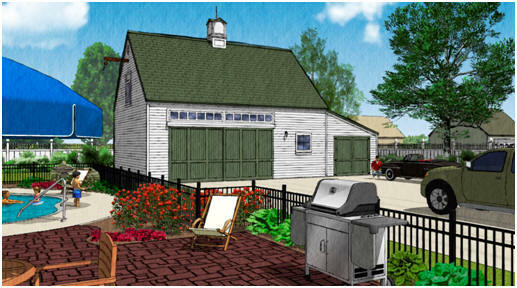 You can build a two, three or four-car country garage or carriage house. Or you can have any combination of garage spaces, storage spaces or workshop areas.